Given that Oregon remains an agricultural and manufacturing hub, and our strategic location along the Pacific Rim, it is no real surprise to see strong exports from the state. In 2014, Oregon exported nearly $21 billion worth of products and through the first half of 2015, the state is on pace to match that figure. Measuring exports relative to the size of the economy, Oregon consistently ranks well across all states. Yesterday we explored Oregon exports by industry. Today we will examine the state’s top destination markets. 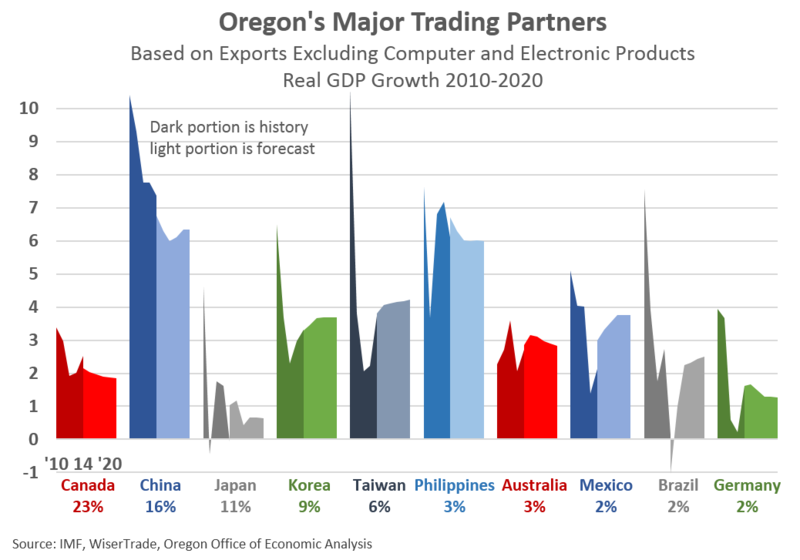 The vast majority of Oregon exports (80%) are destined for one of the 21 countries along the Pacific Rim that are members of the Asia-Pacific Economic Cooperation (APEC) including each of Oregon’s five largest individual markets: Canada, China, Japan, Korea and Malaysia. Prior to the Great Recession these five countries received 50 percent of all Oregon exports, however in the past six years, that figure is now 60 percent, with much of the additional growth coming from products destined to China. Only two other states in recent years have a larger share of their exports heading to China than does Oregon at just over 20 percent: Alaska (lots of seafood, 27%) and Washington (aerospace, 22%). Oregon is not dissimilar in the fact that over the past decade 58 percent of all Oregon exports heading to China are computer and electronic products. Given the state’s technology producers’ global presence and major investments in China in particular, such a pattern is not unexpected. Encouragingly non-computer and electronic product exports have increased in recent years as well. Agriculture, chemicals and machinery have seen strong gains, and until recently wood products (mostly logs) as well. Canada – Oregon’s second largest export market – is similar in that exports are dominated by one large sector but all other industries are seeing gains. In Canada’s case heavy manufacturing exports (machinery, metals and transportation equipment) account for over 40 percent of the total. A large portion of these exports are tied to the mining industry, which has been hit especially hard over the past year with falling oil prices. As such Oregon’s heavy manufacturing exports have declined nearly 30 percent from 2014q2 to 2015q2. Other major export sectors, like agriculture, chemicals and wood products remain relatively robust albeit slowing, likely due to the country’s overall economic performance. Largely due to the low energy prices, Canada’s economy is facing a deteriorating outlook in the near term relative to the recent history, as energy producers have been hit hard by low oil prices even as all other businesses and households gain from the lower prices. Nearly all Oregon exports to Malaysia (3rd largest destination market) are computer and electronic products. Trade with Korea and Japan is more balanced across industries, with particularly strong agricultural exports. This includes a sizable share of of our soft wheat sold to Asian consumers. There is an interesting dichotomy to Oregon exports and discussing their impact on the state and outlook for the future. The fact that much of Oregon’s exports are tied to a specific industry (high-tech) or an industry-sector connection (mining) is a double-edged sword. It leaves overall exports less prone to the business cycle but more exposed to individual industries and their patterns, which can be both beneficial and detrimental, depending. However other products and markets outside of these examples are more tied to global demand. Unfortunately the outlook for global growth is slower in the coming years than in the recent past. The International Monetary Fund (IMF) is forecasting a relative slowing in nearly all of Oregon’s major export markets. While Oregon’s non-tech, non-mining related exports are growing in size and scope, foreign consumers are facing a likely slowdown. Such an outlook is largely not a worry to the broader U.S. economic expansion, however it may have greater impacts on Oregon-specific industries and firms. 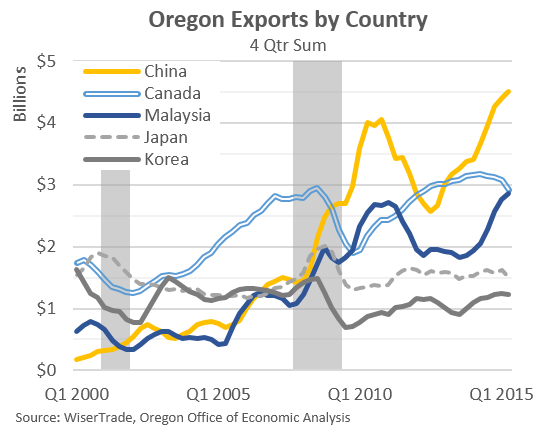 Less-than-fun fact: the only time during a modern economic expansion that Oregon grew slower than the U.S. was following the Asian financial crisis in the late 1990s as our ties to the region weighed on our growth, both broadly but specifically high-tech manufacturing. In particular, a slowing global economy may impact some of the state’s larger firms expecting strong consumer demand from the emerging middle class in many Asian countries. The IMF expects global growth to strengthen after a couple years of relatively weaker growth. Longer term, the vast majority of Oregon’s top export markets are expected to grow considerably faster than is the U.S. or Oregon. Increasing exports to these growing economies is and will be a benefit for stronger growth here at home. Josh, this and yesterday’s graphs are an interesting study. Is there any data on the means by which these goods leave Oregon…trains and boats and planes-type data? Thanks Craig. Yes and no. For the exports, if they’re properly coded, we can get marine vs airplane essentially, not sure about rail. Much of the tech products, which dominate our trade flows, are flown while much of everything else is on boats. Something to look into further.